This time, Jon Rettinger promises more reviews of the actual Newton OS features, which should be fun. Posted by davelawrence8 at 6:27 am on February 17th, 2010. One comment... » Categories: messagepad. 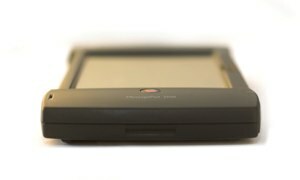 Tags: messagepad, mp2100, newton, review, unboxing, video, youtube. Subscribe via RSS. It’s rough writing about the Newton. There are only a few things that pop up, here and there, that are considered “news” in the MessagePad community. Like fans of the Amiga or Commodore, Newton users try to relive the glory days and make their devices applicable to modern times. Though with the Newton, it’s fun. It’s such a sweet platform. As far as I knew, there was only me and Tony Kan out there blogging at least semi-regularly about the Newton. But sometimes other sites pop up on the radar. The Unofficial Apple Weblog often posts news and updates on happenings in the Newton community – more than the regular, echo-chamber type posts that appear every where else. Every once in a while, something random will pop up. 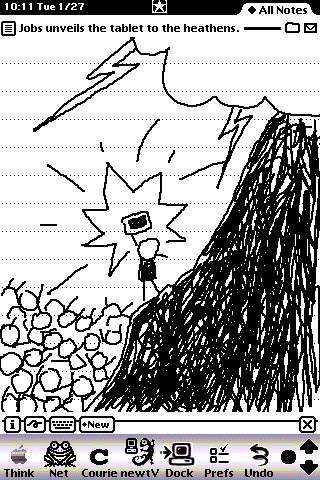 Like High Caffeine Content, a blog from Irish iPhone developer Steven Troughton-Smith, creator of Lights Off and Chalk, an upcoming Twitter client. There’s also Johs Burker and his Blog of Musings. Burker works in education and uses his MP2100 and eMate for real life stuff, like calculating gas mileage and computing on the road. His post on getting RemoteCam working on his eMate is amazing. As for blogs that look like Newtons, you can’t beat Thomas Brand’s excellent Egg Freckles blog. It really speaks for itself. The Newton platform attracts die-hards, hobbyists, and everyone in between. It’s nice to see some of those folks writing about their experiences. As more new technologies are released, leave it to the MessagePad user to figure out a way to make it work with Apple’s PDA. If you’re a Newton blogger, or you know of someone who is, let me know. Posted by davelawrence8 at 6:41 am on December 16th, 2009. 2 comments... » Categories: blogs, community. Tags: blog, blogger, eMate, messagepad, mp2100, newton, remotecam, retro. Subscribe via RSS. - Steven Frank, from stevenf.com, on the ideal mobile device. Posted by davelawrence8 at 6:58 am on September 21st, 2009. No comments... » Categories: messagepad. Tags: ARM, device, messagepad, mobile, mp2100, newton. Subscribe via RSS. Okay, so it’s not an original MP2100 unboxing, but the guy from Pocketnow.com still seems excited. One thing he got wrong: he said the Newton didn’t have Wifi, which isn’t quite right. You just need a few add-ons. Posted by davelawrence8 at 7:11 am on September 18th, 2008. No comments... » Categories: messagepad. Tags: 2100, apple, messagepad, mp2100, newton, PDA, pocketnow, unbox, unboxing. Subscribe via RSS.